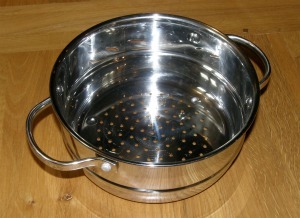 An asparagus steamer is not essential to cook asparagus but will give good results. 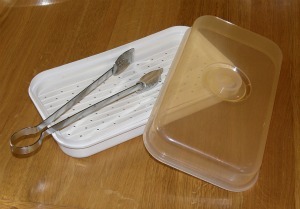 Whilst the traditional asparagus steamer is a tall thin cooking pot which sits on the hob there are four other pieces of equipment that provide alternative but good methods of steaming asparagus. Upright Asparagus Steamer The only one of these specificaly designed for cooking asparagus is the upright asparagus steamer. This asparagus cooker is a tall thin cooking pan (usually stainless steel) with a lid (often glass / perspex) and an internal wire basket. The asparagus sits in the basket usully tied in a bundle (for ease of handling) and water is placed in the bottom of the pan to just below the level of the asparagus stalks. Steam is generated and is able to penetrate the ends of the stalks as well as the rest of the spears. 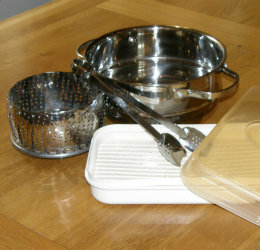 Prices vary but a 14cm steamer may cost around £20. Electric Worktop Steamer My best friend has two boys both more than 6'5" tall who are seriously into eating the right food for all the rugby they play. They have an electric steamer which steams vegetables day in day out. They love it. It has several tiers so they can cook a variety of vegetables at once. They loved it so much we bought their youngest son his own electric steamer to take way to university. Pan Steamer I have one of those steamers that sits on top of your conventional pans with holes in to steam whatever vegetables you choose. This would steam asparagus just fine although it would not be quite the right shape so you might have to cut your spears to a shorter length. I don't use mine because I use the microwave steamer all the time. Fan Steamer I have one of these little fan steamers which are brilliant. It takes up no space in the cupboard, pops into any of my saucepans and can be used to steam any vegetables. We use it for carrots, cabbage, sprouts, you name it...but not asparagus because.... I always use the microwave steamer!!! Asparagus knives are used for harvesting asparagus. They typically have a serrated edge. Some also have a sharp knife edge. They have a slight curve to the blade and are designed to enable the spears to be easily cut below soil level. Typical prices are in the £10 - £15 region. If you plan on making asparagus juice you will probably need a juicer designed for juicing fruit and vegetables. There are a wide variety on the market and you need to do your research. You need to understand the difference between blenders, that include the pulp in the product and make great smoothies, and juicers which extract the pulp leaving you with juice. Centrifugal Great for producing juice quickly but the process allows some heat to build up which reduces the nutritional value of the juice to a certain extent. Also the juice can be foamy and they can be quite noisy (not what you want first thing in the morning!). Good starting point for first time juicers. Hand Ok to get the juice out of a couple of oranges or lemons but hard work or impossible for anything else, often used by cooks to add "the juice of one lemon" etc. Hydraulic Press Very good not very common and very expensive ($2000+). Press the juice out leaving the pulp really dry, make a juice full of nutrients that keep well. Masticating Make VERY good juice, quietly! More juice produced than from a centrifugal juicer but the juice takes a bit longer to make and they are quite expensive. Twin Gear (Triturating) Quiet, effective but expensive ($700), make great juice but not an ideal first time juice machine. Overall I think you are most likely to buy a centrifugal or masticating juicer and these are mostly falling in the price range from £30 to £250. As with most things there is a balance between what you pay for and what you get. Look at the power of the motor and think about how hard you are going to work your machine, also try to work out how easy it is going to be to clean. You will find a range of centrifugal and masticating juicers at UKjuicers and you will also see a range at many retailers including amazon. Whilst not strictly asparagus utensils I find that the best thing to use to move asparagus from cookware to plate is a simple pair of tongs. I call them my asparagus tongs. Mine are the one piece variety that are made of a springy metal. Really easy for picking up a few spears at a time and arranging them nicely on a plate. 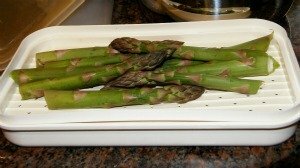 If you take a look around you will find all sorts of asparagus dishes, asparagus serving dishes, asparagus side dishes, asparagus pots, asparagus aprons, asparagus christmas decorations (yes seriously! )just keep your eyes open!!! 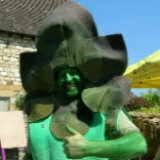 You'll find a few in our Asparagus Store.